Above is the picture of my faithful pens. The red one, which I’ve used for editing over this past year and the lovely one my girlfriend gave me a couple of Christmases ago, which I use for everything else. 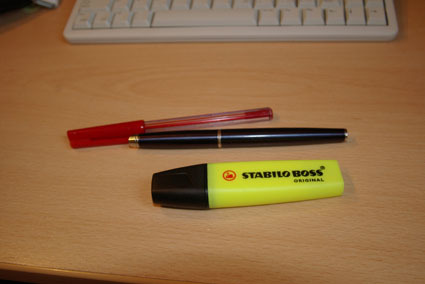 And a highlighter – which is also useful when editing. After a lovely weekend, in which much walking was done, I’ve been getting stuck in to typing up the notes I made on the first draft of my current novel. And, so far, all seems to be going well. 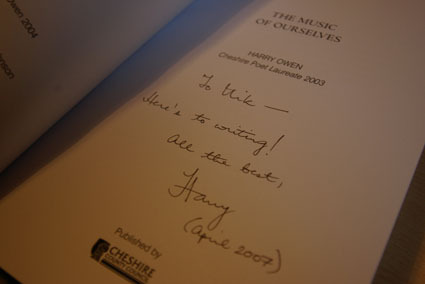 I was thrilled to receive from Harry Owen, a signed copy of The Music of Ourselves – a collection of his poetry. You can check out his website here. Thanks Harry! I wanted to add as well that over the course of the weekend I saw a fair amount of wild animals – the sort you don’t see every day. I saw three birds of prey, a ferret and a badger. Which leads me on nicely to suggesting that those of you who like wildlife have a look at Kate’s, About a Brook blog, which I’ve been enjoying for a good while now.